I remember the first time I heard of the star named Betelgeuse in my Astronomy 3 class at UCLA. The professor was the late famed astronomer George Abell who pioneered the field of galaxy clusters (and now has whole clusters named after him). He started discussing the star but pronounced it “beetle-juice.” People love saying it that way. I certainly did. Over the years, I’ve kept an eye on this red supergiant only 640 light years from Earth. This is one star destined for big things, like a massive explosion. Betelgeuse could become the closest supernova ever witnessed from our planet. Betelgeuse and its red coloration has been known since antiquity, even Ptolemy noted its color in his writings. But it was Sir John Herschel, in 1836, who first described its variable brightness. 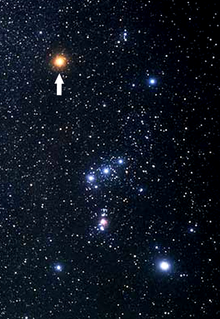 Betelgeuse is an easy star to spot in the night sky as it lies just above the famous belt of Orion. But it is the fate of Betelgeuse that most concerns us Earthlings. It is a relatively young star at 8.5 million years old, but for its size-class it is considered old. At 18 solar masses, it will continue to burn and fuse elements until its core is iron, at which point it will explode as a Type II core collapse supernova leaving behind a neutron star remnant about 20km in diameter (it is possible that the star will end its life as a white dwarf if its mass is on the lower end). A supernova in such close proximity to Earth could have calamitous results – a deadly gamma ray burst (GRB) pointed our way could damage our ecosystem and make most life on the planet extinct. Fortunately, astronomers have determined that we will not be in the line of fire. For a long time, this was the same concern about a Wolf Rayet star called WR 104 which was thought to be ready to blow and appeared to be aiming right our way. In other words we were “looking down a rifle barrel” of deadly high-energy gamma rays. Fortunately, recent spectroscopic observations at the Keck Observatory showed the system actually is inclined 30-40 degrees away from us so we’re safe - for now. The point about killer stars is that our planet is very susceptible to dangerous astrophysical events in our galactic neighborhood. So far, we’ve just been lucky, but given the vastness of astronomical timeframes, our luck will eventually run out. It will certainly run out in a few billion years when our own star will reach the end of its life and become a red giant and engulf the inner solar system, possibly even the Earth. The question is whether we will even be around by then to notice? Great explanation. But if a Star who be 600 light Years from us explodes, the gamma ray will reach us in more than 600 years, isn't it?